Recently, we explained how we now recommend using Interactions rather than Engagement Rate as the best Facebook Page performance metric. As a result of this, we’re now issuing a set of blog posts studying Interactions at a deeper level, to give you a better understanding of this change. Here, we take a look at Interactions and their relationship to Reach in order to see how the two correlate. Author’s Note: This piece has been updated to clarify several vague statements. It includes new data that makes these points as clear as possible. The central thesis remains unchanged: that the better and more engaging a piece of content is, the more impressions it will gain. 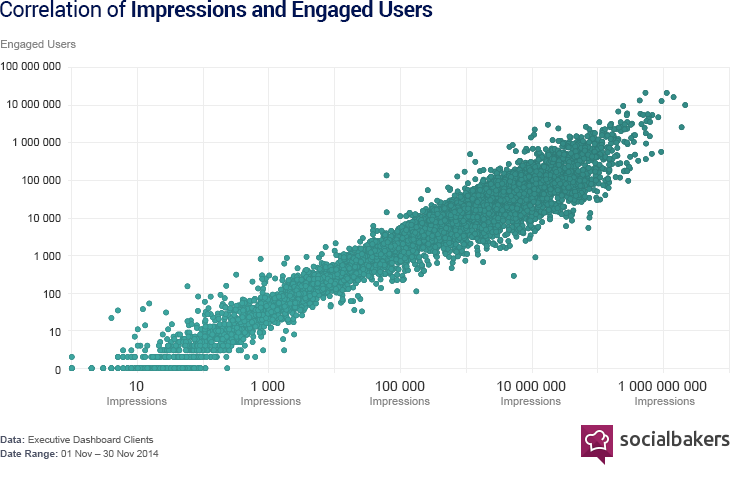 Engagement correlates with Reach, and both drive each other. 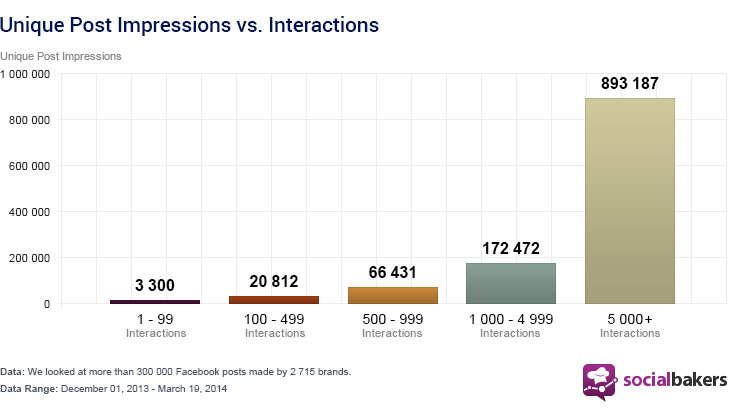 Our data shows that posting more engaging content results in better Reach. For some types of Pages, content is inherently engaging, and Posts get great Reach even when they are not promoted. Think of Celebrity Pages, for instance. They are not dependent on the content they put out in order to build up large Fan bases, because users already Like the Pages of celebrities they admire. So these Pages can post content that gets great Reach – because the part of their Fan base that sees it organically is likely to engage with it (it is content about a subject they actually lower-case "like”, so they’re more likely to Like it). This engagement drives up its Reach, and so the cycle goes. The content goes viral. 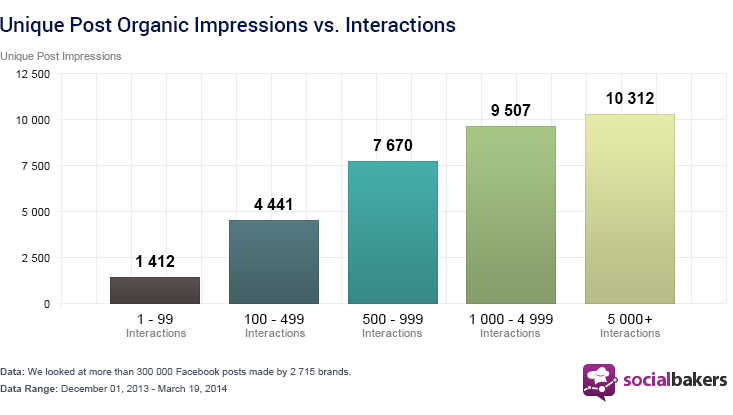 Check out how organic impressions correlate exponentially with Interactions when you consider all types of Pages. 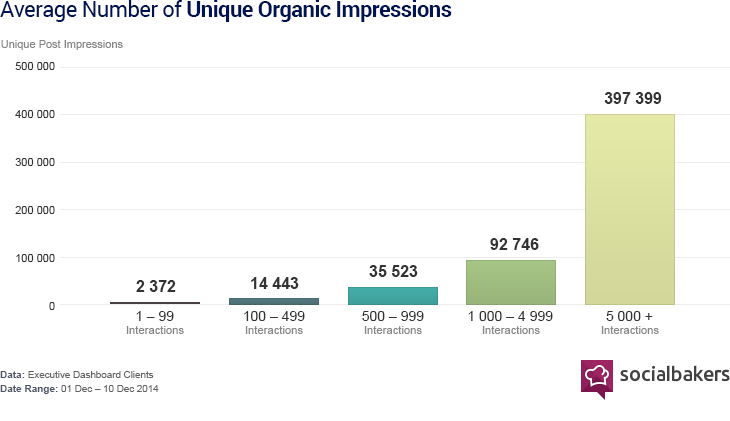 Organic impressions are almost 60% of all these Pages’ impressions. For all Pages, we found that Impressions correlate to engaged users with r = 0.83 – a fairly strong correlation. Post Boosting amplifies this effect dramatically. Try a Free 14-Day Trial Today! Below, you can see the level of Organic Reach gained by Brands (not including other Page types). Compare this to how many total unique impressions, including paid, that the same subset of Pages got. As you can see at the top end of the graph, the posts with 5,000 Interactions-plus are receiving a huge amount of extra impressions. This is due in part to the paid Reach that kicks in at scale at this level. Clearly, this shows the power of amplifying your best posts through great advertising – and how the right posts can achieve huge Reach when they are promoted. Reach naturally correlates with Interactions in that the more Reach you have, the higher your Interactions are likely to be. The more engaging your post is, the more Reach it will get naturally. These are the posts you need to promote. Our data has shown the need to find the right posts to amplify due to the huge effect on Interactions and Reach when you boost the right content. At Socialbakers, we believe that it's about what you can learn from all the metrics, not just one. Focus on Interactions, but make sure to take stock of how engagement defines other aspects of your social performance. The Red Bull team broke the speed of sound but did it also break a record in social media? 2012 was exciting year for us, here at Socialbakers, as we conducted several studies that revealed interesting social media trends. In order to track the development social marketing has undergone in the past year, we’ve brought you a recap of our results.